Private 8 acre Riverfront Retreat only 5 minutes to downtown Durango! Two Houses on 8 private acres of Riverfront, just 5 minutes to Downtown Durango, 25 Minutes to Ski Area, 20 minutes to airport or land your own plane a mile away! Please contact us for availability as the online calendar limits bookings to one home (with 2 homes available, we are usually able to accommodate you). Welcome to Ariel's Nest at Rio Angels! 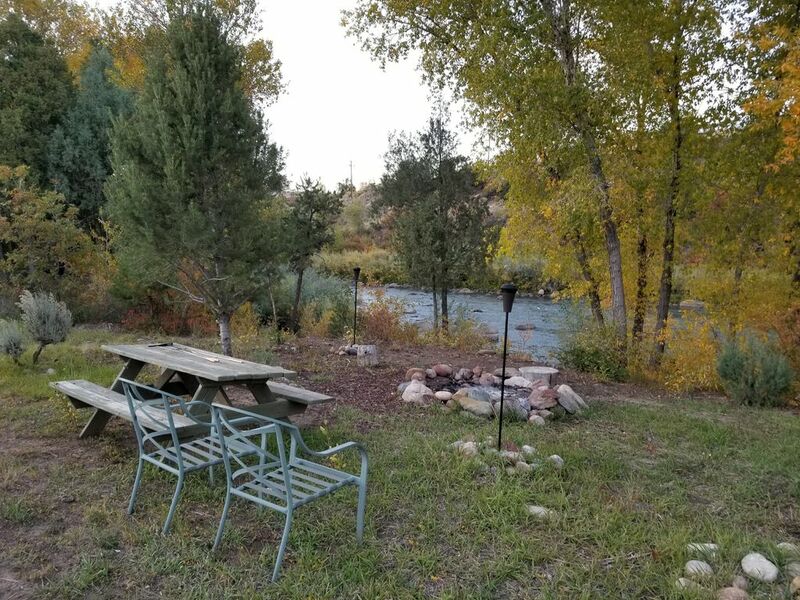 Relax to the roar of the beautiful Animas River right off the many decks of this fabulous 2 bedroom, 2 bath house. Soaring ceilings and expansive 2-story windows face the river where you’ll enjoy 1600 feet of your own private fishing, rafting or swimming paradise. This extraordinary riverfront property is located just 4.5 miles from downtown Durango, yet you will feel like you’re truly on a country vacation, surrounded by huge trees, abundant wildlife, the beautiful Animas River, and spectacular mountains. Fish from your own private nature trail alongside the river with its white sandy beaches and huge boulders. Share a meal with loved ones at the riverside picnic area. Relax in the hammock, play horseshoes, or drive golf balls on the lawn during the day...enjoy the warmth of the fire from the outdoor fire pit overlooking the river, and marvel at the starry night beneath the magnificent firs and cottonwoods. This fabulous house sleeps 4 - 6, with two master bedrooms, one down and one upstairs. Each bedroom sleeps two in grand comfort and features a seating area, its own full bath, and opens on to a furnished deck from where you can enjoy the river breezes and cool mountain air. Downstairs, there is a sleeper sofa in the 2-story living area to accommodate up to 6 guests * (Price based on 4 person occupancy, Extra guest fee applies for groups over 4). Upstairs, the fully furnished kitchen and dining area open to the wooded back yard, and overlook the living area below and two story views look out over a meadow & the Animas River. There is a laundry room with washer and dryer, satellite TV, and hi speed wireless internet. This open, high-ceilinged aerie provides the perfect vacation hideaway. We promise you will want to come back again and again to enjoy the charms of living on the river in the woods while being so close to shopping, skiing and hiking the beautiful Durango area. This great property is available year round, so plan now to host your own winter hunting group or that guys’ fishing vacation! Rio Angels' other home, Gabriel's Cabin, is a charming 3 bedroom, 2.5 bath home on the property (HomeAway #264701). Gabriel's Cabin is also available for rent and sleeps 6 - 8. It features the same amenities, and also has its own riverside seating area, outdoor firepit, wood burning stove and much more. It stands just far enough away for privacy, yet the two houses together are perfect for family gatherings or groups sharing a vacation. With 8 beautiful acres on the Animas River and two fabulous houses, Rio Angels private estate is also perfect for weddings, retreats, corporate gatherings, family reunions, etc. Catering and event planning is available locally to fit all your needs. Please contact us for more information about hosting your special event at Rio Angels! Watch the sunset over the gorgeous Purple Cliffs of Durango. Enjoy 1600 feet of private riverfront on the beautiful Animas River that flows through the front yard. Walk out your door and enjoy fishing, swimming, and relaxing by the river. Outdoor firepit with wood provided. We provide our guests with complimentary day passes to the Durango Rec Center where they can enjoy indoor pools, hot tub, sauna, a splash pad for kids, indoor rock climbing, and workout facilities. Great place to call home temporarily! The house was perfect for our needs. We were a family of 4 and it was nice to have beds for everyone (no sofa sleeper or kids sharing a bed...yay!). The kitchen was well outfitted and no issues finding what we needed for all of our meal preparation needs. The location was perfect with the large front "yard" with fire pit, picnic table and flowing river. There was quick access to the river bike/walk/run path which could take you to town (~3 miles). Also could ride from the house to mt bike trails as well. The owner/manager was very responsive to all my questions. Definitely the choice lodging for us for future visits!! In our opinion, this place is nothing like it is advertised. Beware-- Kitchen and eating area is upstairs. f you have any ADA issues at all, DO NOT rent this place. Dining table upstairs has tiny child-like stools around it--no real chairs. The bedrooms are tiny, can't even move around in them-especially the master. The "master" bed was lumpy, the other twin beds were hard as rocks, sheets were low quality and scratchy. There were hairs on sheets and a dirty hair clip on the bed. Did not get a good feeling about general normal sanitation and cleanliness. Furniture looks like it came from a second hand thrift shop or is pieced together. Furniture is so old that they had to put covers over the sofa and chairs--which also were not clean. End tables were large flat marble stones simply placed on old table legs--very unstable. Dust everywhere, wires/cords hanging down exposed on TV and plugged to an extension cord with too many plugs and lots of dust (fire hazard). Bathrooms were not clean and had spiderwebs--even in the nightlight. No water pressure in showers. Outside is NOT private as advertised. There is another cottage nearby. And this place is in the middle of an Industrial park. So view of river is marred by large construction buildings. You hear lots of road noise. The outside is messy, everything had coats of dust or were musty smelling. Grill cover had so much dust, it looked like it hadn't been used in years. We had to not only bag our trash, but were required to put it in our own vehicle and haul it to a dumpster at another house. Ridiculous. In all fairness, we took our dogs (thinking this was a dog friendly place as advertised) but obviously it is not. They kept our deposit. That would have been fine IF the place even HAD any standards of cleanliness or at a minimum the same standards they seemed to have held us to--which made it feel like they had in mind to keep the deposit from day one, even though they claim they have had other dogs there many times. Hard to believe. At any rate, even without the dogs or keeping our deposit, this is not a place I would ever recommend staying in a million years--absolutely the worst place we have ever rented through Homeaway and we were greatly disappointed. I would have given it NO stars but had to choose at least one star so I chose that. But believe me, this is not a private, comfortable, beautiful retreat! No idea who wrote some of the other reviews on here but they are wrong! In 12 years, we have never had to keep a guest's security deposit before, as we have never had a guest leave the house in such terrible condition. Unfortunately, your dogs did extensive damage to the house including multiple dog accidents that were not cleaned up that left stains on the wood and stone floors, ruined several comforters, sheets and towels which had to be replaced; deep scratches on the wood door; and three additional hours of cleaning required to remedy the situation. For 12 years, we have had countless 5 star reviews describing Rio Angels as "House is cozy, well-maintained, spotless, and well stocked w/ all necessities." -- "Great property. The house was very nice, and clean. The large windows and over abundant porch and balcony space made us feel we were outside all of the time." -- "The accommodations were perfect" -- "Best location in Durango" -- "Super comfortable bedrooms both upstairs and down" -- "Beautiful location, very quiet & peaceful" -- "Clean, comfortable & quiet" -- "This house was perfect for our needs. The two bedroom house had plenty of space for our family of four." -- "The house itself was VERY well set up" -- "House was clean & well stocked with everything you need. Great patios & huge yard overlooking river" -- "What a perfectly gorgeous spot, and yes, George the dog did love it!" -- "This home was perfect for our family of 3 and 1 large dog, Snoop" -- "I can't say enough how private and nice this home is, you will fall in love with the closeness to everything in town". -- "Rio Angels was just exquisite!" We sincerely regret that you were not completely satisfied during your stay, as your review was the first negative rating we have ever received. However, we trust that future guests will love Rio Angels as much as all of our other guests that have provided us with 12 years of excellent ratings. Fantastic location -- very quick access to downtown Durango. The house itself (Ariel's Nest) is VERY well set-up. We were two couples and enjoyed the spot quite a bit. Beautiful big deck upstairs (where the kitchen is located) and super comfortable bedrooms both upstairs and down. Very clean. Great kitchen and beautiful grounds with a great sitting area down by the river. The only very slight negative might be a bit of road noise from the highway but it's fairly minor and didn't bother us in the least. You really can't ask for a more serene spot so close to downtown Durango and all the cool things going on there. My wife and I went to Durango to check out area fly fishing and a quick getaway from Arizona's heat. We found the house and the accommodations to be just what we wanted. Unfortunately, fishing was not good due to the river being down from insufficient water runoff, but we still had a wonderful time. Fortunately, the San Juan River was just about an hour away - with plenty of good fishing. We also enjoyed great hiking and downtown Durango with its really good shops,restaurants and bars. We are looking forward to returning when the Animas gets back to normal. This house was perfect for our needs. The two bedroom house had plenty of space for our family of four. We were able to prepare our breakfast and lunch in the well-stocked kitchen and enjoy our dinners at the nearby restaurants. Our kids enjoyed playing in the yard and down by the river. My husband and I took advantage of the Carbon Junction and Sale Barn trailheads about a quarter mile away to access the extensive trail system for mountain biking. The host made sure to contact us to let us know not to hesitate to call if we needed anything. We really enjoyed our stay! Thanks so much for staying at Rio Angels! We're glad yall had a wonderful time and hope you can visit again soon! Have a beautiful fall!